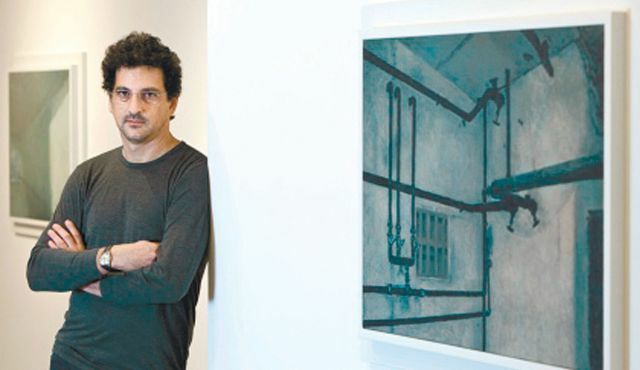 Art that deals with the Holocaust isn’t supposed to be abstract, says Mexican-Jewish artist Yishai Jusidman, whose exhibition opens this week in Manhattan. The painting shown in the first photo above is remarkably similar to one of my photos, which is shown above. I took my photo inside a building at the Memorial Site of the Natzweiler-Struthof concentration camp and put it on this page of my website. To get this photo, I had to go behind the cremation oven; I suspect that few people have taken this particular shot. Do you notice any difference between my photo and the painting by Yishai Jusidman? Look at the lower right hand corner of my photo: there is a bit of a circular metal object. Above the circular object is what looks like a door frame that is painted blue. 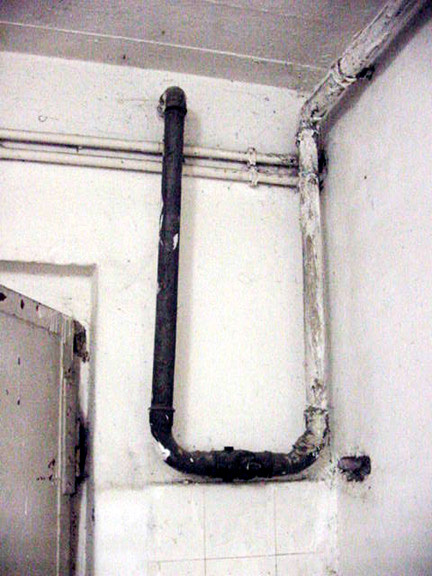 Now look at my photo below, which was taken from the opposite side of the room that shows the pipes. Notice the blue door frame on the right side of the oven. 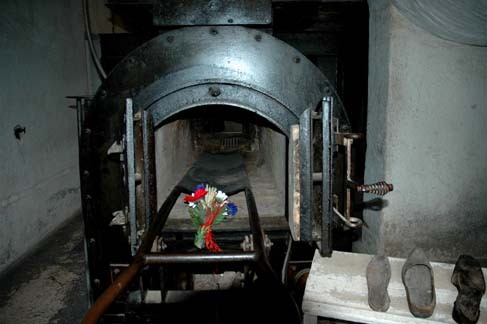 The photograph [above] shows the single oven in the [Natzweiler-Struthof] crematorium. Until the crematorium was finished in October 1943, the corpses were burned in a mobile crematorium placed near the farm at Struthof, about half a mile from the main camp. The expression “treated with gas” refers to experiments in which prisoners were subjected to mustard gas and then treated for their burns in an attempt to find the best antidote for the gas. Mustard gas had been used as a weapon by both sides in World War I, so the Nazis wanted to be prepared in case the Allies decided to use it again in World War II. As a young man, serving in the German Army in World War I, Adolf Hitler had been temporarily blinded by a gas attack, so he was not inclined to use gas as a weapon, even though the Nazis had deadly serin gas available as a Weapon of Mass Destruction. In taking the two photos above, my purpose was not to be artistic. I wanted to show that the cremation oven was located right next to the outside wall of the shower room. I included a bit of the oven, in order to show how close the oven was to the wall. In the photo of the oven, I included the door frame in order to show how close the oven was the the wall of the shower room. I believe that the water for the shower might have been heated by the cremation oven. 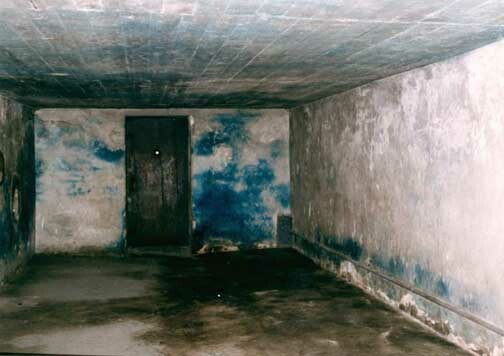 Jusidman painted a picture of the outside wall of the Natzweiler-Struthof shower room, but deliberately cut the oven out of the picture so that he could pass this off as the inside of a gas chamber. 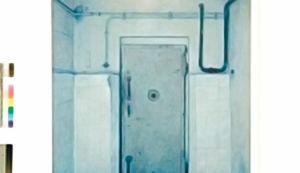 He deliberately painted in a door to make the viewer think that the inside of a gas chamber is shown, when in actuality, his painting shows the outside wall of a shower room. The article about the paintings of Jusidman also includes the photo below. Judisman did his paintings from photographs; the painting of the Mauthausen door is remarkably similar to a photo on this page of my website. Can anyone guess what my purpose was in photographing the Mauthausen gas chamber door in this way? Hint: I was not trying to be artistic. I also took the photo below to make it absolutely clear what I was trying to say. I followed the water pipes from the morgue room into the gas chamber and then photographed the pipes inside the gas chamber. 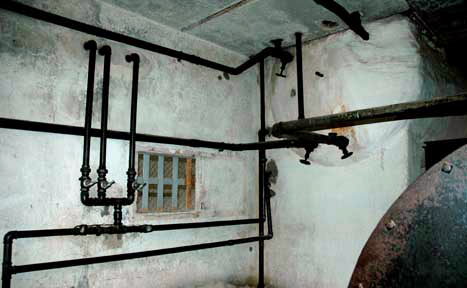 The Mauthausen Memorial Site does not claim that poison gas came through the shower heads in the gas chamber. 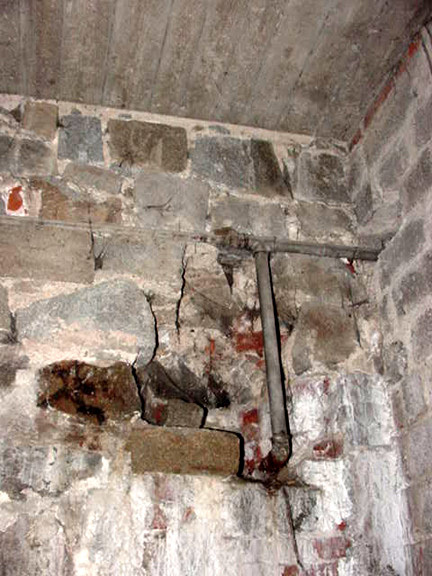 The claim is that the Mauthausen gas chamber had a device for inputting the gas that was removed by the Nazis before they abandoned the camp. 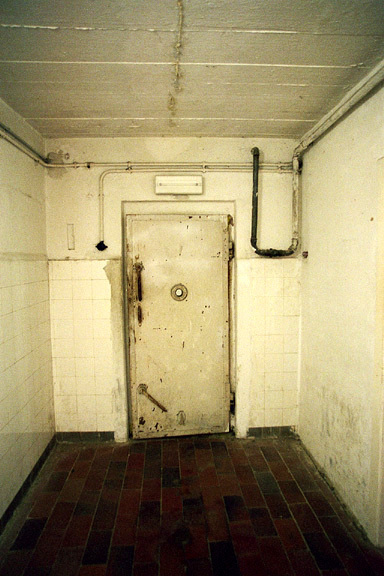 Jusidman’s artistic painting of the door into the Mauthausen gas chamber ignores the fact that my photos prove that the Mauthausen gas chamber was a shower room, not a gas chamber. Unless, of course, the shower room was a multi-purpose room where the prisoners could shower or be gassed with Zyklon B. Despite his direct use of historical materials, Jusidman reiterates that this is not an exhibition about the Holocaust. “My paintings do not deal with the Holocaust, but rather with the possibility of its representation,” Jusidman says in an interview with Haaretz Gallery. Or his paintings could deal with misrepresentation of photographs that were taken to disprove the gassing of prisoners. This morning, I received an e-mail with a copy of a poem written by one of the French survivors of the Buchenwald concentration camp. The poem, which was sent to me by Susan Perry Ferguson, can be read in full here. Susan is the daughter of Major Julian S. Perry, the American soldier who found the poem, written by an unknown prisoner after the liberation of Buchenwald. The poem was originally written in French; you can read the full text here. In a little bit of comfort. Who lived through the slaughter that was extermination. The previous processions fell upon no peaceful haven. No less than 42,000 human beings died. So we will return to France, to our family homes. Feelings of emptiness, which are many, spoil our return. Against the race of murderers and sadists. The poet wrote “The previous processions fell upon no peaceful haven. No less than 42,000 human beings died.” The word “processions” is a reference to the thousands of prisoners who were marched out of the Buchenwald camp, before the camp was liberated, in an attempt to prevent them from being released by the American soldiers who were on their way. 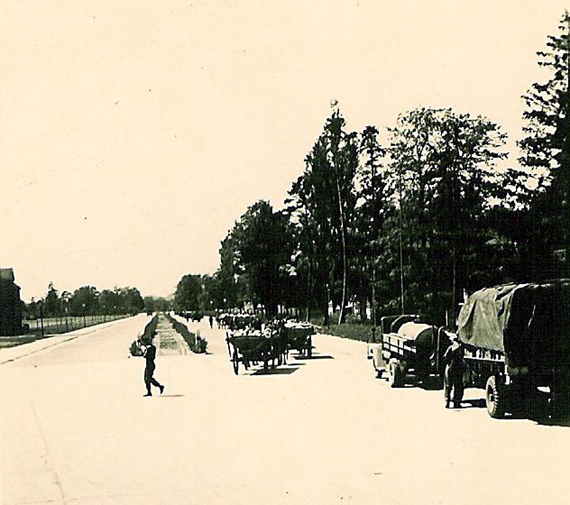 The prisoners in the “processions” were marched five miles to the train station in Weimar, the closest city to the camp. 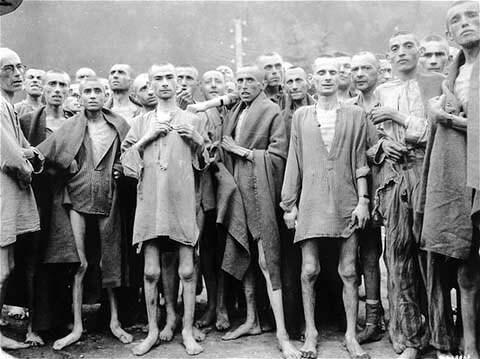 The prisoners were put on a train and taken to the Dachau concentration camp, where most of them were dead upon arrival. You can read about it here. The total number of deaths at Buchenwald is unknown; you can read about the death statistics at Buchenwald here. The unknown author of the above poem was a French Resistance fighter, who was sent to the Buchenwald concentration camp, after he was captured. The French Resistance fighters were civilians who had continued to fight during World War II after France had surrendered. Buchenwald was primarily a camp for political prisoners, who were opponents of Hitler’s Third Reich. The prisoners included prominent Communists and Social Democrats, as well as French, Polish and Dutch resistance fighters, and also pastors of the Confessional Church and Catholic priests who preached against the Nazis. A Monument to the Resistance Fighters stands on the highest point of the hill called the Ettersberg, about one kilometer from the former camp. 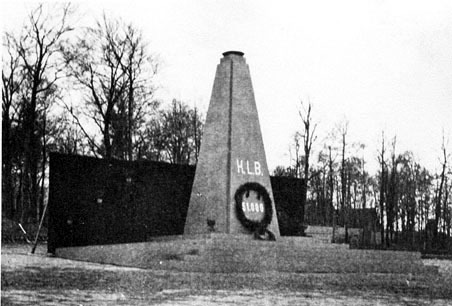 A photo of the monument is shown below. On April 11, 1945, the day that American troops arrived to liberate the Buchenwald camp, the Communist resistance fighters had already taken control of the camp and forced the SS guards to flee for their lives. When the American liberators arrived, they observed that some of the resistance fighters had left the camp and were hunting down the SS men in the surrounding forest. The SS soldiers were brought back to the camp and shot, hanged or beaten to death by the inmates while the American soldiers looked on and sometimes joined in. The Americans were met by reasonably healthy looking, armed prisoners ready to help administer distribution of food, clothing, and medical care. These same prisoners, an International Committee with the Communist underground leader Hans Eiden at its head, seemed to have perfect control over their fellow inmates. After World War II ended, the Germans were prosecuted as “war criminals” because the Resistance fighters had been put into concentration camps, rather than POW camps. The resistance fighters from German-occupied countries who had continued to fight as partisans, killing German soldiers and blowing up trains, were called innocent victims by the American prosecutors in the American Military Tribunal trials at Dachau because they had been imprisoned in concentration camps after they were captured. Although the Geneva Convention of 1929 did not give the same rights to insurgents as to Prisoners of War, it was the prosecution’s opinion that the partisans and resistance fighters in German-occupied countries were the equivalent of POWs and entitled to the same Geneva Convention protection. 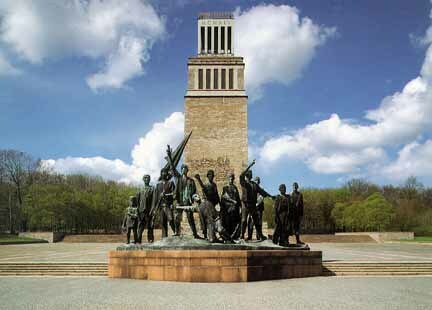 The monument shown in the photo at the top of my blog post is the memorial that was erected by the Communist prisoners at Buchenwald on 19 April 1945 in honor of the political prisoners in the camp. The Jewish survivors were not allowed to attend the ceremonies when the monument was dedicated. The stone monument was moved in 1961 to a spot called Frederic-Manhes-Platz, which is the place where the road to the camp branches off from the main road up the hill called the Ettersberg. The place where it now stands was named after a French Resistance fighter named Col. Henri Frederic Manhes. Buchenwald was just one of the camps to which captured partisans in the French Resistance were deported. The main camp for French Resistance fighters was Natzweiler-Struthof, which now has a Memorial Site with a Museum devoted to the French Resistance. The core of the Buchenwald Oath is: We will take up the fight until the last culprit stands before the judges of the people. Our watchword is the destruction of Nazism from its roots. Our goal is to build a new world of peace and freedom. This is our responsibility to our murdered friends and their relatives. After the Buchwald Oath was read aloud, the prisoners raised their hands and said, “We swear”. In keeping with their promise to build a new world of peace and freedom, the Buchenwald camp was turned into a camp for German prisoners after World War II. You can read about it here. In 1997, a Museum was opened at the Buchenwald Memorial Site which tells about the German prisoners at Buchenwald after World War II. As the poet wished, the dead were avenged. The oath that the poet said needed to be asserted was that every last culprit should stand before the judges of the people. This actually happened when 31 people were put on trial by the American liberators. You can read about the trial here. The term “death camp” is used by Holocaustians to mean a Nazi concentration camp where prisoners were taken to be deliberately killed in gas chambers or worked to death. The term Vernichtungslager (extermination camp) was coined by the Allies to refer to the six Nazi “death camps”: Chelmno, Belzec, Treblinka, Sobibor, Majdanek and Auschwitz-Birkenau. The POW camps set up by General Dwight D. Eisenhower, after World War II ended, are also called death camps, because 1.7 million German POWs allegedly died in these camps. To read more about Eisenhower’s camps, go to this website or this website. You can read about an American soldier’s experience as a guard in one of Eisenhower’s camps here. I previously blogged about Eisenhower’s death camps here, but it bears repeating. The German city of Gotha was the first headquarters of the victorious American Army in Germany, set up by General Dwight D. Eisenhower in April 1945. Gotha was also the site of one of the Prisoner of War camps set up by Eisenhower. General Eisenhower mentioned Gotha in his book Crusade in Europe, as the nearest city to the “horror camp” at Ohrdruf-Nord, the only concentration camp that he ever visited. He failed to mention his own notorious POW camp located near Gotha. On March 10, 1945, as World War II was coming to an end, General Eisenhower signed an order creating the status of Disarmed Enemy Forces for the German Prisoners of War who would soon be surrendering to the Americans. This order was a violation of the Geneva Convention because it allowed Eisenhower to disregard the rules for the treatment of Prisoners of War. It allowed him to starve the German POWs, deny them the right to send and receive letters, and to receive Red Cross packages and packages from German civilians. All of these rights were enjoyed by the prisoners in the Nazi POW camps and even in the notorious concentration camps. Eisenhower signed this order before he had even seen the horrors of the Ohrdruf camp. There were no tents in the Gotha DEF camp, only the usual barbed wire fences round a field soon churned to mud. On the first day, they received a small ration of food, which was then cut in half. In order to get it, they were forced to run a gauntlet. Hunched over, they ran between lines of guards who hit them with sticks as they scurried towards their food. On April 27, they were transferred to the U.S. camp at Heidesheim further west where there was no food at all for days, then very little. On May 7, 1945, the German army had surrendered to General Eisenhower, who refused to shake hands with the German General, as is customary. The neutral country of Switzerland was removed as the Protecting Power for German prisoners, which was another violation of the Geneva Convention. General George S. Patton quickly released the prisoners who had surrendered to his Third Army, but General Eisenhower held his POWs until the end of 1946, forcing them to live on starvation rations. German civilians were forbidden to bring food to the POWs. Red Cross packages sent to the German POW camps were returned. The POW camps had no barracks or tents. The German prisoners were forced to dig holes in the ground for shelter, as the picture above shows. Even though the American army had plenty of tents, the prisoners lived for months in their holes. When it rained, the holes collapsed and the prisoners died. After 1947, most of the records of the POW camps were destroyed by the U.S. government, according to James Bacque, as written in his book Other Losses. Bacque wrote that the Germans claimed that 1,700,000 soldiers, who were alive at the end of the war and had surrendered to the Allies, never returned home. All of the Allied countries denied responsibility, and the families were never told what had happened to their loved ones. Starting in April 1945, the United States Army and the French Army casually annihilated about one million men, most of them in American camps. In fact, German prisoners taken by the U.S. Army at the end of the Second World War were denied these and most other rights by a series of specific decisions and directives stemming mainly from SHAEF–Supreme Headquarters, Allied Expeditionary Force. General Dwight Eisenhower was both supreme commander of SHAEF–all the Allied armies in northwest Europe–and the commanding general of the U.S. forces in the European theatre. He was subject to the Combined Chiefs of Staff (CCS) of Britain and the U.S., to the U.S. Joint Chiefs of Staff (JCS), and to the policy of the U.S. government, but in the absence of explicit directives–to the contrary or otherwise–ultimate responsibility for the treatment of the German prisoners in American hands lies with him. On April 26, 1945, the Combined Chiefs approved the DEF status for prisoners of war in American hands only: the British members had refused to adopt the American plan for their own prisoners. The Combined Chiefs stipulated that the status of disarmed troops be kept secret. The problem was not supplies. There was more than enough material stockpiled in Europe to construct prison camp facilities. Eisenhower’s special assistant, general Everett Hughes, had visited the huge supply dumps at Naples and Marseille and reported: “More stocks than we can ever use. Stretch as far as eye can see.” Food should not have been a problem, either. In the U.S., wheat and corn surpluses were higher than they had ever been, and there was a record crop of potatoes. The army itself had so much food in reserve that when a whole warehouse was dropped from the supply list by accident in England it was not noticed for three months. In addition, the International Red Cross had over 100,000 tons of food in storage in Switzerland. When it tried to send two trainloads of this to the American sector of Germany, U.S. Army Officers turned the trains back, saying their warehouses were already overflowing with ICRC food which they had never distributed. Nonetheless it was through the supply side that the policy of deprivation was carried out. Water, food, tents, space, medicine–everything necessary for the prisoners was kept fatally scarce. Camp Rheinberg, where Corporal Liebich would fetch up in in mid-May, shivering with dysentery and typhus, had no food at all when it was opened on April 17. As in the other big “Rhine meadow” camps, opened by the Americans in mid-April, there were no guard towers, tents, buildings, cooking facilities, water, latrines, or food. On May 8, V-E Day, the German government was abolished and, simultaneously, the U.S. State Department dismissed Switzerland as the protecting power for the German prisoners. (Prime Minister Mackenzie King of Canada protested to the foreign Office in London the parallel removal of the Swiss as protecting power in British-Canadian camps, but was squelched for his pains.) With this done, the State Department informed the International Red Cross that, since there was no protecting power to report to, there was no longer and point in visiting the camps. 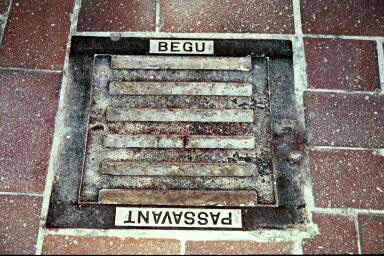 You can check here to confirm that the photo above was taken by the US Army Signal Core at the Ebensee sub-camp of Mauthausen. Note that the description of the photo says that the camp (Ebensee), where this photo was taken, was reputedly used for “scientific” experiments. Reputedly? Sorry, not good enough. In Auschwitz experimental medicine was tried by doctors (namely Dr. Helmuth Vetter) on sick patients, mostly typhus. 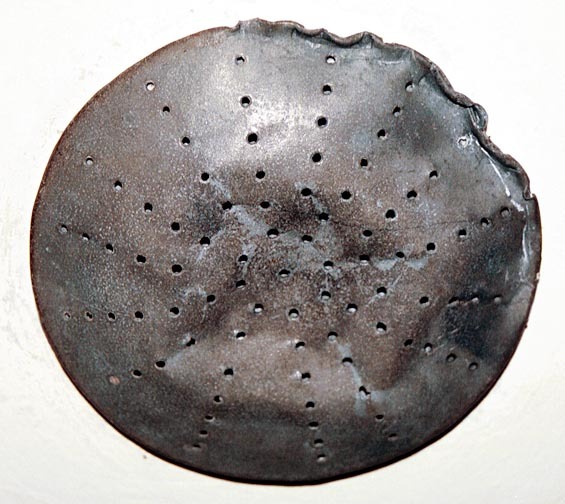 However, even when it was obvious the patient was being hurt, the experiment would continue. Many patients lost their lives and few were saved. Even worse, the experiments were not trying to cure the patients but to see bodily reactions to the disease and different medicine. In conclusion, by carrying out these experiments and trying them on inmates in the camps, the Nazi physicians broke their Hippocratic Oath (stated in the Introduction) that had been put in place and followed for almost two thousand years. They not only broke their promise as a doctor but they killed and injured many innocent prisoners for the simple reason of wanting to find out how individuals would react to different amounts and types of medicines. Even though the photo might show survivors of a medical experiment, the men in the photo are probably not survivors of the medical experiments in Block 20 in Auschwitz, which is what the article is about. The survivors of the Auschwitz experiments might have joined the “death march” out of Auschwitz, and they might have ended up at Ebensee, where there was a typhus epidemic in progress, but it is highly unlikely. 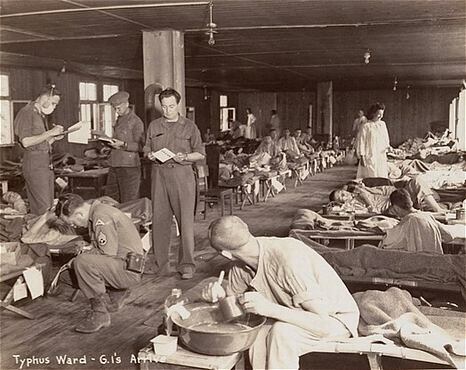 The photo below, which is also included in the article about Nazi medical experiments, was taken in the typhus ward at Dachau; American doctors are caring for the typhus patients. The above photo was taken by the US Army Signal Core at Dachau; yet it is used in a history course by the University of California at Santa Barbara to illustrate Nazi medical experiments. What’s wrong with that, you ask? Substituting photos is totally disingenuous and should be against the law. The photo should be identified, on the UCSB website, as being a photo taken in a typhus ward at Dachau. As for the Ebensee camp, here is the real story, which the students at Santa Barbara should have been told. 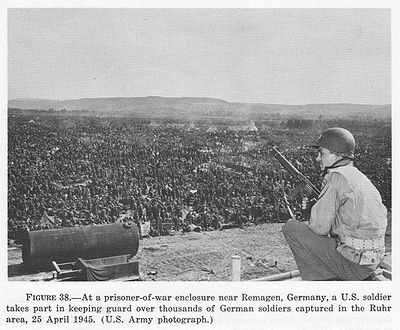 The photograph above was taken on May 6, 1945, after Ebensee, a sub-camp of the Mauthausen Concentration Camp, was liberated by soldiers in the 80th Division of the US Third Army on May 4th and 5th. The banner, written in French, reads “The French prisoners Salute the Allies.” It was erected by the anti-Nazi resistance fighters who were imprisoned here after being captured and accused of doing acts of sabotage during the Nazi occupation of France. 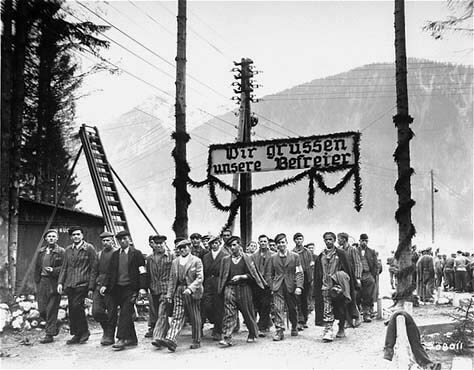 The photograph above shows a sign that was erected by the German prisoners in the Ebensee camp. The English translation is “We welcome our liberators.” Among the German prisoners were some who were condemned criminals that had been released from the regular prisons and sent to work in the concentration camps. The prisoners at Ebensee worked in underground factories which manufactured Messerschmitt airplanes. German engineers and civilians also worked in these factories. The Ebensee site was chosen because there were natural caves which could be enlarged into tunnels so that the munitions factories could be protected from Allied bombing raids. According to Martin Gilbert, the author of a book entitled Holocaust, Ebensee was an “end destination” for Jewish prisoners who were evacuated from camps farther east as the Soviet Army advanced toward Germany. In the last months of the war, the Ebensee camp was seriously over-crowded with these exhausted prisoners, many of whom had just arrived in the weeks prior to the liberation. Jews who had already survived the “selections” in Birkenau, and work as slave laborers in factories, had now to survive the death marches. Throughout February and March  columns of men, and crowded cattle trucks, converged on the long-existing concentration camps, now given a new task. These camps had been transformed into holding camps for the remnant of a destroyed people, men and women whose labor was still of some last-minute utility for a dying Reich, or whose emaciated bodies were to be left to languish in agony in one final camp. According to Gilbert’s book, a train loaded with 2,059 Jews arrived at Ebensee on March 3, 1945. They had survived the death camp at Auschwitz-Birkenau and had first been sent to the Gross Rosen concentration camp, then on to Ebensee. Forty-nine of the Jewish prisoners died on the train, and on their first day in the camp, 182 died during the disinfection procedure. New arrivals had to be disinfected to kill the body lice which spreads typhus. There was a typhus epidemic in Mauthausen and the sub-camps and, according to Martin Gilbert, 30,000 prisoners died in these camps in the last four months of the war. According to Martin Gilbert, the last death marches of the war began on May 1, 1945 as the American Army approached; prisoners from the main camp at Mauthausen and the sub-camps at Gusen and St. Valentin were marched to Gunskirchen and Ebensee. Hundreds of them died from exhaustion, or were shot because they couldn’t keep up, or as they attempted to escape. When American troops in the 80th Infantry Division arrived on May 4, 1945, there were around 60,000 prisoners from 25 different countries at Ebensee. You can read more about the Ebensee camp on another blog here and here. January 27, 2013 is the 68th anniversary of the official liberation of the three Auschwitz camps by the Soviet Union on January 27, 1945. The German SS men, who ran the camp, had left on January 18, 1945, taking 60,000 prisoners with them on a “death march” out of the camp. You can read all about Holocaust Remembrance Day here on a website, which includes a video about the Auschwitz Album, a book of photos that gives “visual evidence” of the mass murder at Auschwitz. I previously blogged about International Holocaust Remembrance Day here and here. The photo above was taken by me in 2005. 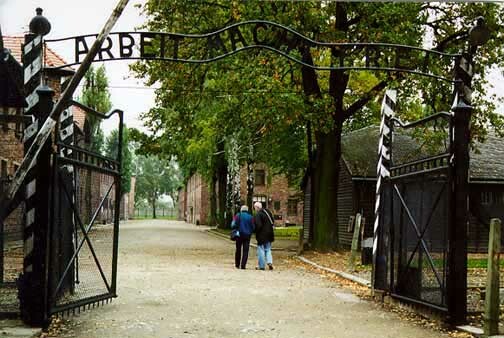 The green arrow in the photo points to the exit door from the Auschwitz administration building. 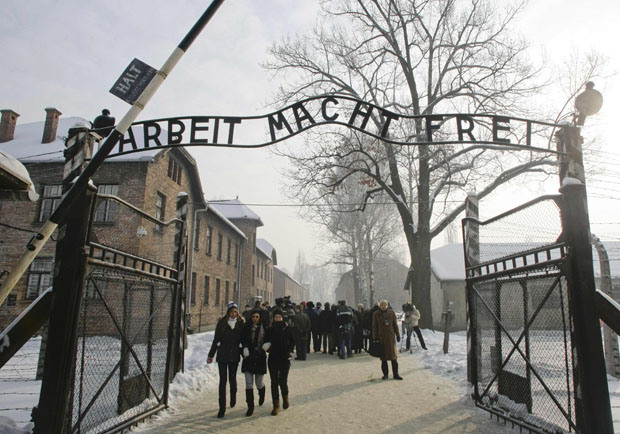 The next thing that visitors see is the iconic sign “Arbeit Macht Frei” over the entrance to the Auschwitz I main camp. 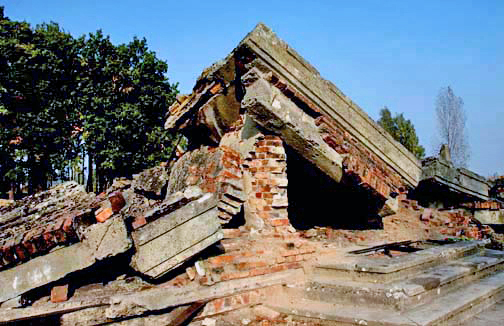 The ruins of Krema III, one of the four gas chamber buildings at Auschwitz-Birkenau, are shown in the photo below. There were 611 children in the Birkenau camp who stayed behind when the camp was evacuated on January 18, 1945. There were 4,428 women and girls and 169 boys who stayed behind when the Auschwitz-Birkenau complex was evacuated. Around 2,000 prisoners were left behind in the men’s camp at Birkenau; there were around 1250 men in the main camp who did not join the march out of the camp and 850 men, including famous survivor Primo Levi, who chose to stay behind at Monowitz. According to Holocaust historian Danuta Czech, the evacuation of the three camps began in the early morning hours of January 18, 1945 when 500 women with children were escorted out of the Birkenau camp by SS guards. They reached Wodzislaw on January 21st. The men arrived the next day and all men, women and children were loaded onto open railroad cars and taken to Germany. The prisoners at the Auschwitz III camp (Monowitz), and all the prisoners in the Auschwitz sub-camps, marched to the four concentration camps at Gleiwitz near the German border, arriving on January 21st. They were then taken on trains to the Buchenwald, Dachau, Sachsenhausen or Mauthausen camps in the Greater German Reich. 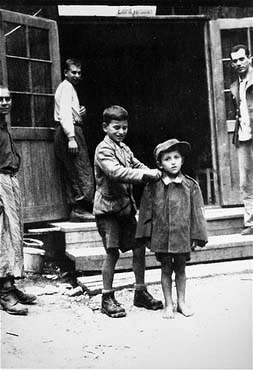 The Hungarian Jews, shown in the photo above, are looking toward the Sauna building, where there was a shower room. 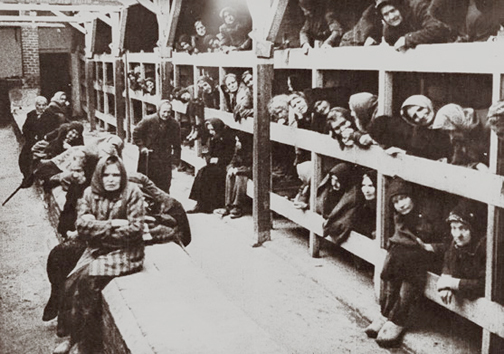 Behind them are the clothing warehouse buildings, known as “Canada.” There were no showers for them; this photo is “visual evidence” that these Jews are waiting for the gas chamber in Krema IV (not shown), which is behind them, and to the left in the photo. 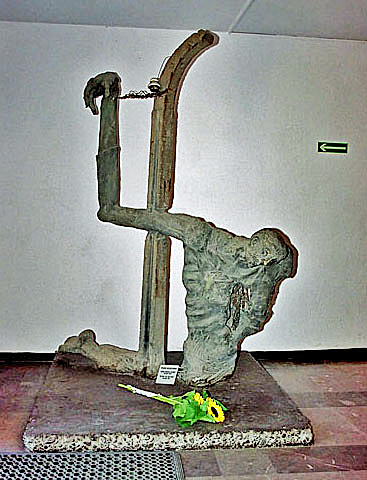 Krema IV was blown up by the prisoners. Each of the survivors in the photo above has a story to tell about how they beat the odds and were not chosen by Dr. Death (Dr. Josef Mengele) for the gas chamber. Eva Schloss, who is Anne Frank’s step sister, survived the Auschwitz-Birkenau death camp by wearing her mother’s coat. They [the incoming prisoners] only knew him as Dr. Death. He [Dr. Josef Mengele] was the man who went through the lines of men and women, pulling the weak from the strong. He was the one at the Auschwitz concentration camp who decided who would live and who would die. Eva Schloss remembered how she wore her mother’s coat on the day she got there. It covered part of her face, hiding her youth, which if discovered by Dr. Death, would have sent her straight to the gas chambers. “It saved my life,” she said of her mother’s coat. According to the article, Eva was born in 1929, the same year as Anne Frank, so she was 15 years old when she arrived at Auschwitz-Birkenau where Dr. Josef Mengele was one of more than 30 doctors and SS men who made the selections. Prisoners under the age of 15 were sent to the gas chamber, but Eva was in no danger because she was 15. Anne Frank, who was also 15, had no trouble getting past Dr. Death, even though she was barely 5 feet tall. In the summer of 1942, Eva’s world was shaken again. She and her mother separated from her father and brother because no one wanted to shelter four people in small apartments. They acquired fake identification, and she and her mother would occasionally venture out to visit her father and brother, though it was always risky. Eventually, the family was told they needed to find a new hiding place. Schloss’ mother heard of a safe house from a nurse in Amsterdam, but when they arrived, it turned out to be a trap — a Nazi house. The Nazis captured all four family members on May 11, 1944, Eva’s 15th birthday. The family was taken to the Auschwitz death camp, she said. “We knew about Auschwitz. 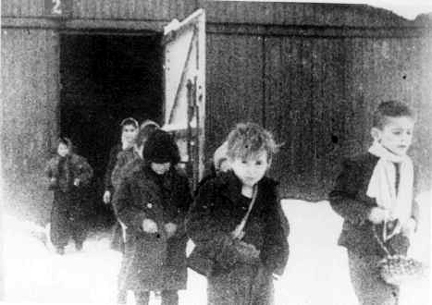 We knew it was a death camp, not a work camp, not a labor camp,” she said. That’s where they saw Dr. Death. Only Eva and her mother survived. They were evacuated by a Russian army in 1945, and taken east, as fighting was still going on in the west. Her mother went on to marry Otto Frank, the widowed father of Anna Frank in 1953, making Eva Anna’s stepsister. Eva Schloss was saved because, apparently, she did not get typhus at Auschwitz. She was not transferred to Bergen-Belsen, like Anne Frank, because she was not sick. She was saved from the typhus epidemic at Bergen-Belsen which killed Anne Frank. I previously blogged about the fate of Anne Frank here. Eva Schloss wants the world to think that there was only one doctor at Auschwitz and that the prisoners knew him as “Dr. Death” even before they arrived. Ms. Schloss wants the world to think that the only reason that anyone survived Auschwitz was because the one and only doctor, who selected the prisoners for the gas chamber, was completely unable to determine a person’s age. According to Wikipedia, Otto Frank was born in 1889, so he was 56 years old when he arrived at Auschwitz in 1944. Everyone older than 35 was immediately sent to the gas chamber, according to Holocaust historians, yet Otto Frank passed the selection by Dr. Death. Did he wear Anne’s coat to make himself look younger? Dr. Friedrich Pfeffer, the dentist who hid with Anne Frank’s family, was the same age as Anne’s father; both were born in 1889, the same year as their arch enemy, Adolf Hitler. How did he pass the selection process at Auschwitz? Another person who arrived at Auschwitz, along with Otto Frank and his family, was Hermann van Pels. There is a photo of him on display in the exhibits at the Anne Frank House; the text accompanying the photo says that he died in the gas chamber at Auschwitz in either September or October 1944, several months after he arrived. Hermann van Pels was the youngest of the three adult men who hid along with Anne Frank; he was born in 1890 and was a year younger than both Otto Frank and Dr. Fritz Pfeffer, but still not young enough to pass the selection by Dr. Death when he arrived at Auschwitz. Peter [van Pels] seems to have worked in the camp post office and he held up well. His father, however, like Otto Frank and Fritz Pfeffer, was assigned an outdoor job. When Hermann injured his finger, probably in early October, he gave up and asked his kapo to assign him to a barracks detail the next day, even though he must have known how dangerous that was for anyone who, like himself, was injured or in ill health. And indeed on that very day, the SS made a clean sweep of the barracks. Selection. Hermann van Pels fell victim to this arbitrary system. And I’ll never forget the time in Auschwitz when seventeen-year-old Peter van Pels and I saw a group of selected men. Among those men was Peter’s father. The men marched away. Two hours later a truck came by loaded with their clothing. So there you have it. Otto Frank proved that Hermann van Pels was gassed because he had injured his finger. Otto saw the clothing worn by Hermann van Pels on a truck, which proves that he had been gassed. Van Pels was 55 years old when he arrived, yet he had passed the selection by Dr. Death, and was not selected to be gassed until he injured his finger. Eva Schloss needn’t have worried. The famous Dr. Death absolutely could not determine age, to within 20 years. Because of this, every survivor alive today has his or her story of how they fooled Dr. Death. I am writing a new post in response to some information supplied by The Black Rabbit of Inlé in a comment. I was pleased to learn that Pat Lochridge used pseudonyms in her article about the tour of Dachau, taken by residents of the town of Dachau. She mentioned, in her article about the tour of Dachau, that the mayor of the town was the “newly liberated” and “newly appointed” mayor of Dachau. The name that she gave was the name of a man that I had never heard of. I didn’t realize that Lochridge was using pseudonyms. Who does that? Lochridge was a graduate of the Columbia School of Journalism. You can be sure that a graduate of the University of Missouri School of Journalism would not have done that. 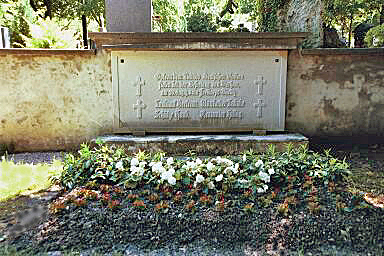 The photograph above shows the grave of Georg Scherer, a Dachau resident who was a prisoner in the Nazi concentration camp for five years. After the camp was liberated, Scherer was appointed Deputy Mayor of Dachau by the American Military. Scherer had been sent to the Dachau concentration camp on December 22, 1935 because of his anti-Nazi Communist activity, but was released on January 17, 1941. As a prisoner, Georg was living at the same place where he had served an apprenticeship as a lathe operator in 1921 at the German Industrial Works which was located on the site of the former gunpowder factory. The Dachau camp was established on the site of the former factory in 1933. After he was released from the Dachau concentration camp, Scherer continued to work in a factory, located in the SS garrison, which was right next to the concentration camp. On April 28, 1945, the day before American Soldiers arrived to liberate Dachau, Scherer led the Dachau Uprising in which residents of the town joined escaped prisoners in fighting against the SS soldiers. Another prisoner, Walter Neff, also remained at the camp after his release, working as an assistant to Dr. Rascher in his medical experiments. Neff also participated in helping the Dachau prisoners to escape and in planning the uprising. Dachau’s oldest existing burial plot is the Altfriedhof, which means Old Cemetery in German. 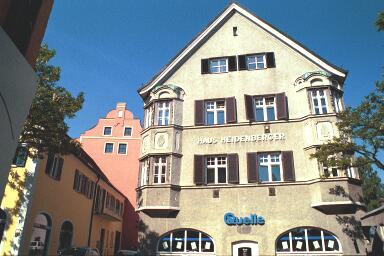 It is located on Gottesackerstrasse, which is just off Augsbergerstrasse, one of the two main streets in the town. Gottersacker means “God’s own acre.” This cemetery was started in 1571 after the original cemetery in the churchyard of St. Jakob’s Church was filled up. A beautiful Baroque chapel, called the Chapel of the Holy Cross, was built here between 1627-1628. This Chapel was dedicated in 1961 to Dachau’s war dead. 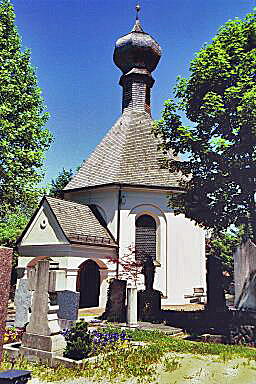 The photograph above shows the Chapel with graves in front of it. The photo above shows the Görlitz Memorial for 4 soldiers who fought the Communists in the town of Dachau. This is the final resting place of four men of the Freikorps Görlitz, a militia group which fought the Red Army of the Communists. The names on the grave stone shown above are 2nd Lieutenant Bertram, Muskateer Labuke, Private Hauk, and Gunner Hilbig. They were killed near the village of Pellheim, just outside the town of Dachau, on April 30, 1919. They were engaged in a battle against the Communists who had set up a Soviet government in the state of Bavaria, after overthrowing the imperial government, under their Jewish leader Kurt Eisner, on November 7, 1918. The memorial stone for the men who died while liberating the town of Dachau from the Communists was set in place on April 29, 1934. Ironically, on this same date eleven years later, the American Seventh Army liberated their Communist allies from the Nazi concentration camp in Dachau. In the early days of the Dachau concentration camp, the bodies were not burned, as there was as yet no threat of epidemics, and cremation was not customary back then. The first prisoners who died in the concentration camp were brought to the Old Cemetery to be buried. 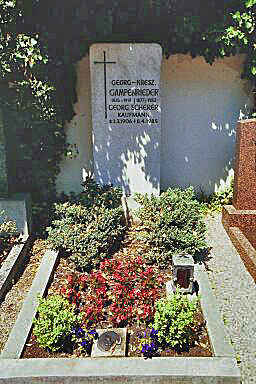 One of the first to be buried here was a Communist member of the Reichstag, 32-year-old Franz Stenzer, who was “shot while attempting to escape” from the Dachau concentration camp on August 22, 1933. 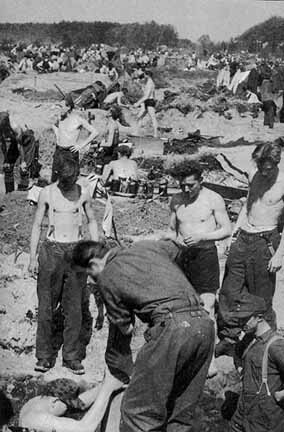 In those days, a death in the camp was a big event and the SS men even attended the funerals. Today I read a blog post, written by a follower of my blog; you can read his blog post for yourself here. Below are photographs of an article entitled “Are Germans Human?” which appeared in the July 1945 edition of Woman’s Home Companion magazine, published by the Crowell-Collier Publishing Company of Park Avenue, New York City. The article was written by American war-correspondent Patricia Lochridge after her trip to the Bavarian town of Dachau, and its sensationalised concentration camp. I originally wanted to track down this article due to its title, and Lochridge certainly had nothing but contempt for the Germans—even the children—she meet in Dachau, but what is really startling about her description of the Nazi horror camp, is the conspicuous absence of any mention of the gas chamber. Lochridge writes in the article of being escorted around the town of Dachau by an “interpretor sergeant”, and meeting several Germans. She states: “The Americans liberated the camp three days earlier …”. Dachau was surrendered to the U.S. Army on April 29, 1945, meaning Lochridge likely toured the Dachau camp and town on May 2, 1945. When I read that German citizens of Dachau were “likely” forced to tour the Dachau concentration camp “three days” after the camp was liberated, I remembered that I had read, in a book entitled Legacies of Dachau, written by Harold Marcuse, that the German tour of the camp took place on May 7, 1945, the same day that German citizens of the town of Dachau were forced to haul 2,400 corpses out of the camp. 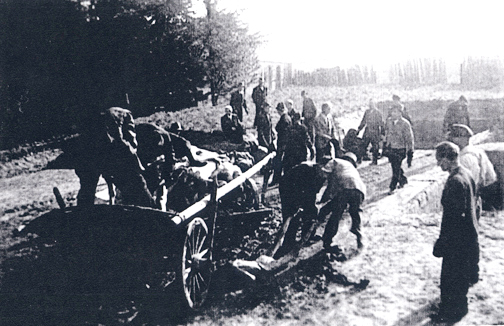 Local farmers from the Dachau area were forced to haul the corpses of the Dachau prisoners, who had died in the typhus epidemic, to Leitenberg, a hill near the camp, where they were buried in mass graves, even though their names were known. The farmers had to dress in their best Sunday clothes and the wagons had to take a circuitous route through the town of Dachau. The US Army had plenty of trucks and personnel for this task, but it was important to humiliate the locals and make them feel guilty. 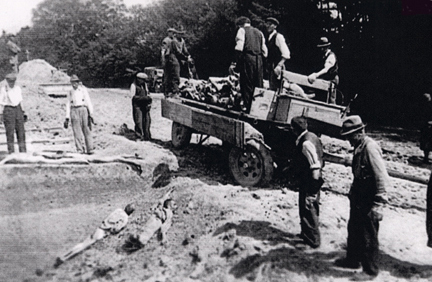 While this burial work was taking place, an America officer decided to take a group of 25-30 responsible but not directly implicated Dachau notables on a tour of the Dachau concentration camp (illustration 9) They were followed by journalists and an army film crew. […] Patricia Lochridge, who had been an exchange student in Germany before the war and had accompanied the Dachau notables on their tour, sought out some of the involuntary participants a short time later and asked them about their reactions to what they had seen. Were there two tours of Dachau, made by German citizens of the town? As far as I know, there was only one tour of Dachau, taken by residents of the town. Illustration 9 in Marcuse’s book shows the backsides of two mature men, wearing fedoras, who are looking at the bodies in the morgue room in Baracke X. This room is adjacent to the shower room, which is now claimed to have been a “gas chamber,” although not for mass gassings. Left to right, in the photo above, the Congressmen are Senator Wherry from Nebraska, Senator Brooks from Illinois, Representative Vorhys from Ohio and Representative Richards from South Carolina. The American soldier who is standing between Senator Wherry and Senator Brooks is James Bolin. He is the third man from the left. Were the bodies, found in the morgue room on the day of liberation, still there on May 7th when the Germans toured the camp? That would have been 8 days after the camp was liberated. 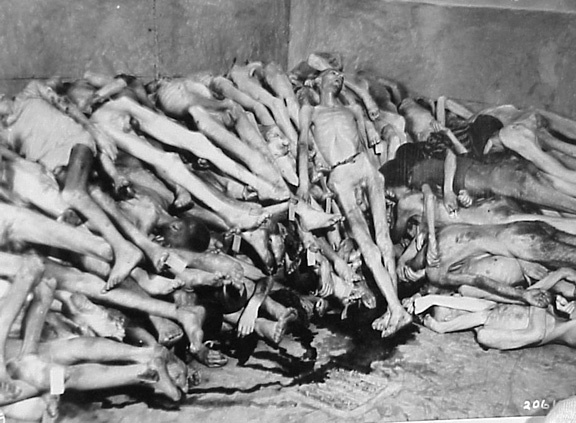 These bodies were being kept for the benefit of American soldiers who were brought to see the atrocities at Dachau, on the orders of General Eisenhower, who wanted as many witnesses as possible to the German atrocities, in case that some day people would try to deny it. 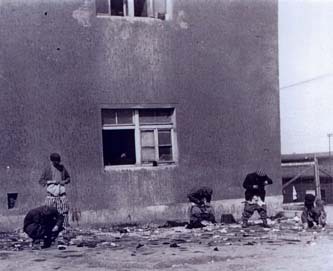 Thus when news of Dachau’s liberation on 29 April reached the high command, General Patch ordered that the evidence of German brutality be left untouched awaiting inspections. 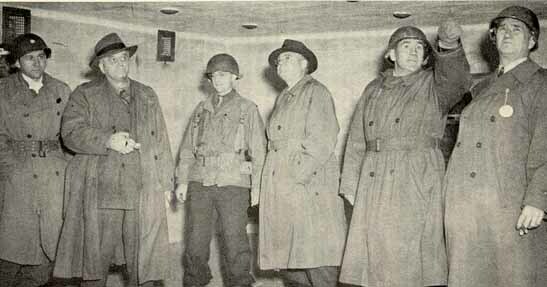 Four members of the congressional delegation toured Dachau on 1 May, within 48 hours of liberation. The 18 member newspaper delegation arrived on 3 May. […] In a pre-tour briefing upon arrival in Paris, Eisenhower made clear to the delegation of journalists why the US government had brought them to Germany to tour the concentration camps. […] He wanted somehow to make the American people know what sort of savages we were dealing with. I read the whole article, written by Patricia Lochridge, and I didn’t see the word “typhus” but maybe I missed it. Was she vaccinated for typhus before going inside the camp? I did read that Lochridge was a graduate of Wellesley and also a graduate of the Columbia University School of Journalism. Columbia University was the home of the Frankfurt school, which included Herbert Marcuse, the grandfather of Harold Marcuse. To his credit, Harold Marcuse did write about the typhus epidemic in his book Legacies of Dachau. Lochridge wrote, in her article about the tour, that the mayor of Dachau was Edmund Suse, a name that I had never heard before, even though I have done extensive research on Dachau. She mentioned that Suse was a “newly released” prisoner of Dachau, and had been “newly appointed” as the mayor, apparently by the American military. Marcuse names 5 different mayors of Dachau, but the name Suse was not included. Lochridge also mentioned that “two Polish girls” were working as “slaves” in a Dachau home. 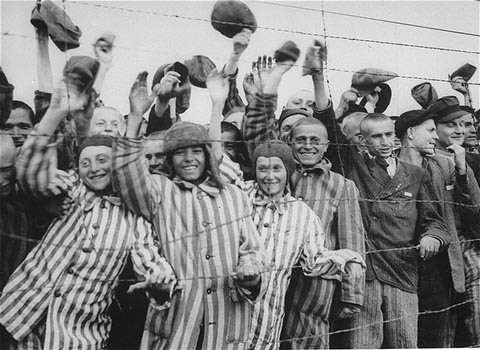 Dachau was a camp primarily for men. 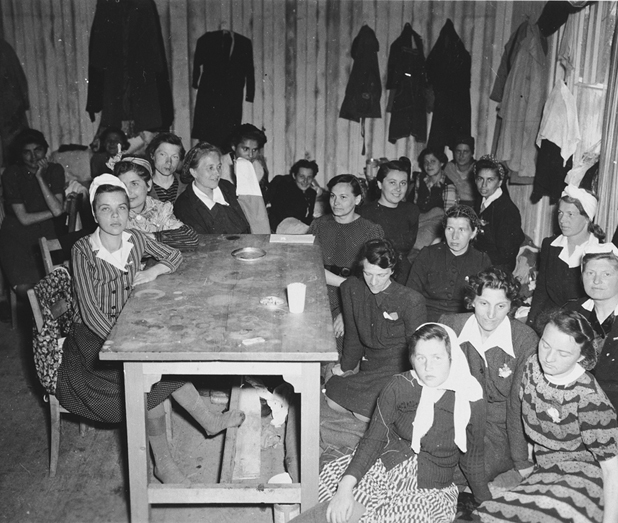 The few female prisoners worked in the homes of Dachau residents. Patricia Lochridge wrote what was expected of a graduate of the Columbia School of Journalism. Apparently, she was not told about the “gas chamber” at Dachau, or she most certainly would have included it in her story of the tour of the camp. Her assignment was to demonize the German people, and “make the American people know what sort of savages” the Germans were; she accomplished that with her story. The residents of the town of Dachau knew very well what was going on in the camp. The SS guards came to the town to party with the locals, and two former prisoners of Dachau lived in the town. 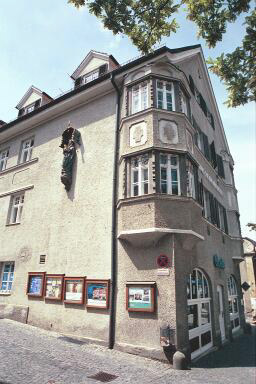 The four-story building in the two photographs above is the former location of the Cafe Belstler, which was a popular spot for drinking and dancing during the years that the SS had a Training Camp and garrison west of the Dachau concentration camp. If there were any atrocities going on in the Dachau camp, the locals would have known about it. There has been some recent discussion in the comments on my blog about the Dachau gas chamber and what visitors are currently being told by their tour guides. I decided to do a search to learn what other bloggers are saying about their recent visits to Dachau. I found this blog post which you can read in full here. Then we came to the spot I had been dreading. The showers. I had heard the stories before. In college, I took a Holocaust history class, where everything was explained in graphic detail. Prisoners were told to take off their clothes and enter the showers to clean themselves off. Once they got inside, the doors were slammed shut, and a gas bomb was slid though a sliding door. When people realized what was going on, they would claw and fight there way to the top, gasping for air. Eventually, they would lose control of their bowels, before they would finally succumb. On a recent trip to Germany, I met my in-laws and discovered the rustic beauty of Bavaria. […] …hidden just miles from these beautiful sites, is a place that holds a much darker story — a history that many people would like to forget. This is Dachau…The first Nazi Concentration Camp. And, a place both of my grandparents barely escaped with their lives. This is not another lesson in the horrors of the Holocaust. There are plenty of those. This is just my personal story…The story of a descendent of Jewish survivors…The story of my first experience visiting the site where they were robbed of their childhoods. In the above quote, the writer reveals that he is Jewish; both of his grandparents were survivors of Dachau. His grandparents were robbed of their childhoods, which means that they were young children when they were in Dachau. Or were they? It sounds suspicious to me. There were a few young boys in the Dachau camp when it was liberated, but I have never seen any photos of young girls in the camp. 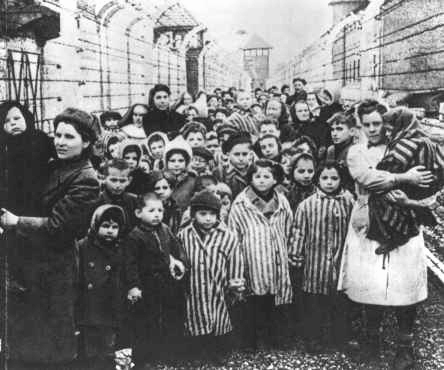 As has already been mentioned, there were times when even children were imprisoned in Dachau. The International Committee saw to it that they were not abandoned. A school was organized for Russian children under a Yugoslavian teacher, and the older ones were placed in Kommandos [subsidiary work camps of Dachau] where they were looked after by prisoners who tried not only to keep them in good health but to teach them the rudiments of a trade as well. Wait a minute! The barracks were “burned down”? Where did the German “war criminals” live when the camp was turned into a prison for Germans after the war? You can read about War Crimes Enclosure No. 1 on my website here. 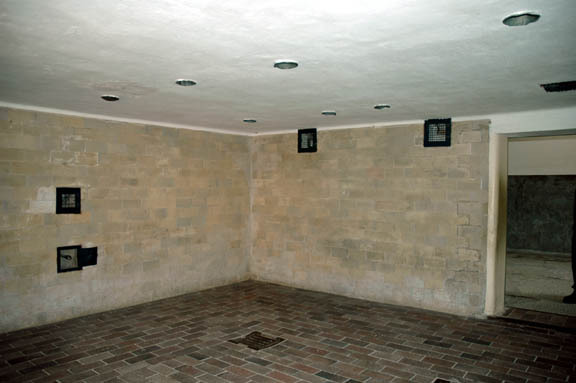 After the American Military Tribunal trials were completed, the barracks at Dachau were used, for 17 years, to house the German expellees who had been evicted from their homes in the former Czechoslovakia and from their homes in Poland and other countries. You can read about the ethnic Germans who were expelled here. The expellees were kicked out of the barracks at Dachau when it was decided to make the former camp into a Memorial site in 1960. It was at that time that the barracks were torn down. 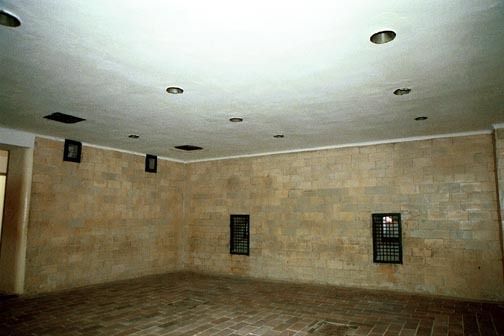 The barracks that visitors now see at Dachau are reconstructions, built when the camp was turned into a Memorial Site. The SS did NOT build a “model unit” to show to visitors. When visitors came to tour the camp, while it was a concentration camp, they were shown the barracks of the Jehovah’s Witness prisoners because these prisoners kept their barracks very clean. The original barracks had toilets, unlike the barracks in the internment camps in America, which had toilets in a separate building. The prisoners were originally housed in old factory buildings; the grounds of the Dachau camp originally housed a munitions factory during World War I. The factory had to be abandoned because the Germans were not allowed to have weapons, according to the Treaty of Versailles, which was imposed on the Germans at the end of World War I. 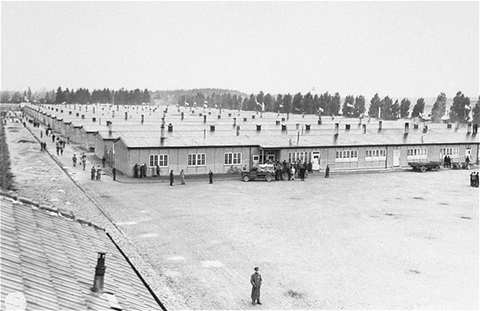 In 1938, new barracks buildings were built at Dachau. The photo below shows the barracks that were used for the Dachau prisoners from 1938 to 1945. We walked up to a rather strange structure. It looked like a jumble of metal with no real purpose. We both commented on how ugly it was. Then we overheard some passersby discussing the site. You can read about the International Monument and see more photos of it on my website here. We stood inside the gas chamber and I felt sick. I thought I was going to throw up. I didn’t think about what happened there. I couldn’t. I just felt the raw emotions. Looking at the way the building was set up, you could see how systematic and well organized everything was. There were two separate entrances. The prisoners would enter a waiting room with instructions and benches to hold their clothes. The building might have been set up to be systematic and well organized, but was it originally set up as a gas chamber? The photo above shows a blueprint of the Baracke X building where the gas chamber (or shower room) is located in the space that is numbered 5. This space was called the Brausebad (shower) on the original blueprint. The blogger didn’t mention how the gas entered the room. However, he did take a photo inside the gas chamber — an artistic photo of someone’s legs and feet, beside one of the drain holes. Wait a minute! Why was there a drain hole in a gas chamber? Wouldn’t the gas have gone down the drain and poisoned everyone in the whole camp? Of course, the six drain holes are now closed up, but if the Germans were going to close the drain holes, why put them there in the first place? The drain holes indicate that the gas chamber was originally a shower room, which was modified to make it into a gas chamber. I previously blogged about the floor drains in the gas chamber here. 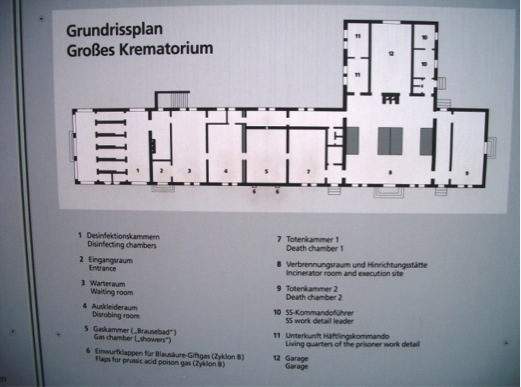 On the other side of the “shower” room was the crematorium, with a separate entrance for the SS. The bodies were literally taken out of the gas chamber and shoveled right into the ovens to be cremated. Not quite. The bodies were first put into the morgue room, which was right next to the gas chamber room. From there the bodies were carried to the ovens, a few at a time. There was, in fact, an outside entrance into the oven room, as well as an entrance from the morgue room. Why would there be a shower room in a crematorium. I previously blogged about this here. This is the second blog post that I have read, which was written by a blogger, who did not do any research before visiting Dachau. Visitors should find out the facts before they go to Dachau, so they can be prepared to challenge tour guides who tell them that the barracks at Dachau had no toilets, and other lies about the former camp. I am a Muslim intellectual woman who teaches Judaism and Islam, a Muslim who seeks dialogue with Jews, a Muslim who sympathizes with Jews and understands the need for the state of Israel. The past year has been an intense one for me and my family. On March 30, I gave birth to a beautiful girl, Ruya, who happens to share her birth date with Moses Maimonides, the great 12th century Jewish philosopher and physician. At the end of June, I was invited to present a paper at a conference in Elmau, a small resort town 50 miles south of Munich. The conference was organized by the University of Munich’s department of history and Jewish studies and co-sponsored by University of California. It was titled, “Judaism Through Muslim Eyes and Islam Through Jewish Eyes.” I teach at a variety of Southern California universities, and I was honored by the invitation to be part of such a unique international conference, which included esteemed scholars and intellectuals whose work has had a deep resonance for me, in terms of both my political and religious thinking. As the conference ended, I was asked what I intended to do in Munich for the next three days, and our plan was to visit Dachau and meet with an old German friend. 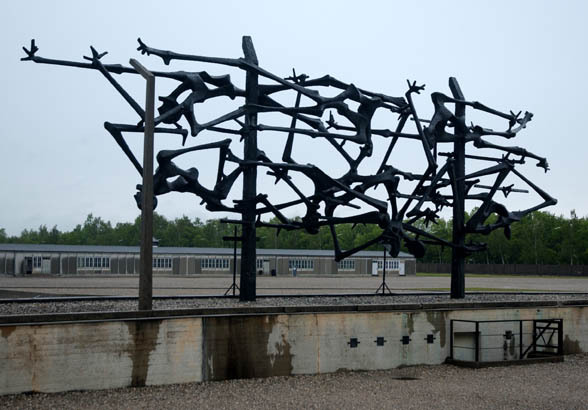 My feelings about the visit to the concentration camp had not been sorted out; I just knew that I wanted to visualize something I had read about in many post-Holocaust testimonies. But my eagerness to go to Dachau was deeper than I thought. I wanted to go to Dachau because I wanted to pay my respects to the many Jews, Christians, and Gypsies who had perished and been abused there; I went as an act of simple respect for the dead. Dachau was a Nazi German concentration camp built on the grounds of an abandoned munitions factory near the medieval town of Dachau, which is located about 10 miles northwest of Munich, in southern Germany. 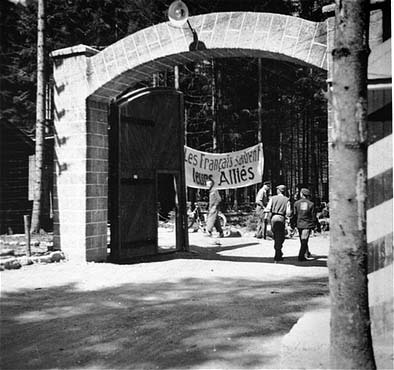 As one walks toward the camp, there is an iron gate nested in between bushes and tall oak trees with the slogan: “Arbeit Mach Frei” (work will set you free). When the Nazis opened Dachau in March, 1933, Heinrich Himmler, the police president of Munich, described it as the Nazi’s first camp for political prisoners. One can still visit the barracks where the many prisoners and SS guards were housed: the long, gray buildings with low ceilings today contain exhibitions of old propaganda, art and SS paraphernalia. It is not hard to envision the harsh reality the prisoners had to face or the lives of the SS guards. When we stepped off the train, we saw the sign for Dachau; I began to see the sadness in the words and wondered how anyone living there today could bear to give out their address. How would the effect of memory and narrative intersect here? As I carried my daughter in my arms toward the front gate, she began to howl in a chilling manner, and I am still amazed at myself for bringing my newborn to one of the most atrocious places on earth. I am not sure whether this was something I could have predicted, but as we approached, Ruya was exceptionally unhappy — my child who rarely cries — and her shrieks made it all seem even more difficult. The camp was bare, with white pebbles in the square and an empty space that spoke of the horror that lay in the lives of the prisoners, and the terrifying howls of my baby echoed throughout time. Dachau became a prototype for the Nazi camps that followed, and it retains a bareness and coldness that evokes its history. The exact number of how many passed through the camp is unknown, according to the Encyclopedia Judaica, which also reports that 160,000 prisoners were registered on the files and about 90,000 in the camp’s branches. But many more transported there in the last days of the camp were not registered. 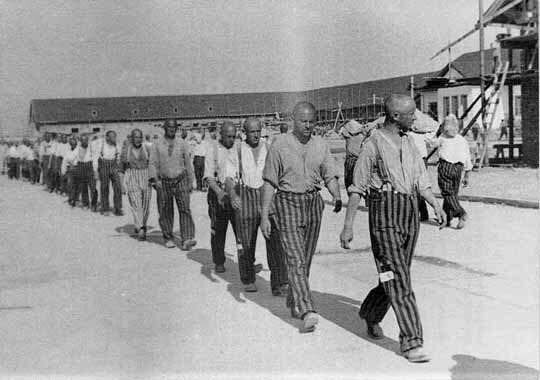 Some inmates stayed in the camp, some were transported further in “death transports” and others were murdered or died there: as many as 32,000 prisoners died at Dachau of starvation and disease. In early 1945, a typhus epidemic spread through the camp, which led to an evacuation and the death of a large number of already weakened prisoners. Dachau was also the site of the first medical experiments on prisoners. As Ruya cried, I asked my husband to keep walking so I could stop to feed her, and as I did so at the bottom of the steps of the barracks, I felt the haunting cries of so many children there before us. My daughter sucked on her milk with tears streaming down her cheeks. As I approached the camp, I found myself saying an Islamic prayer for the dead in the courtyard, and I felt a sense of responsibility to the victims. At that moment, I felt as if I were a witness giving testimony to all Muslims. As someone who has witnessed numerous Holocaust deniers and anti-Semites, I found myself standing alone in the courtyard of Dachau, watching my daughter’s eyes become blinded by the white stones of the camp and thinking to her out loud, telling her that this very act of remembering and sharing the atrocities with others is the only assurance that this will never happen again to anyone. My baby daughter squinted at me with her wet lashes as I held her in silence. We were led toward the crematorium and she calmed a bit, and I pushed her in her stroller into the gas chamber, a dark room with showerheads looking down upon us. It was as if she and I alone were witnessing the moment before the horror. This was the moment when I saw her scrutinize the ceiling, and I knew there was something uncanny about her newness, freshness and innocence witnessing the closeness of death. I walked out vowing that she too must in some way become a witness for all future generations of Muslims. My photos of the Dachau gas chamber are shown below. She mentioned that the gas chamber was “a dark room.” Did this woman actually SEE the showerheads? Or did she just assume that there were showerheads on the ceiling? 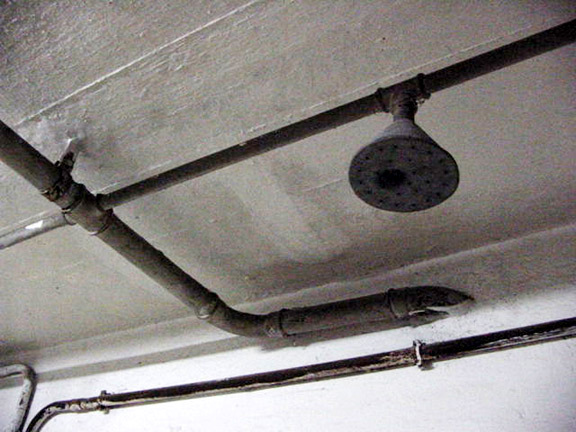 I took a photo of the last remaining showerhead in 2001, and as far as I know, all of the showerheads, that were stuck into the ceiling, with no pipes, are all gone now, stolen by souvenir hunters. Apparently, she did not have a tour guide to point out the two windows on the east wall, through which gas pellets were thrown into the room. The tour guides at Dachau have given up telling visitors that gas came though the shower heads that were just stuck into the ceiling with no pipes. Dachau is one of the most famous of the Nazi concentration camps and was liberated by Allied forces on April 29, 1945 — less than 10 days before the end of the war. Soon after the British and Americans arrived, images and reports of the camp gave the world the first shocking visions of what had happened there. And now here I was, experiencing it firsthand — not a journalist, not a Jew, not a Christian, not a liberator, but a Muslim sharing this public memory. I have studied the history of Dachau extensively, and to my knowledge, there were no British soldiers among the liberators of Dachau. You can read about the liberation of Dachau on my website here. Witnessing is, as so many post-Holocaust writers have spoken of it, a form of speaking. And Dachau is a place where silence can be broken and where the atrocities can now be declared openly. I became a witness of the ghosts and survivors of Dachau. But more notably, I felt that even by witnessing just one camp — or one death — it is as if I have witnessed a million camps and a million deaths. “the atrocities [at Dachau] can now be declared openly?” I didn’t know that there was a time when “the atrocities” at Dachau could NOT be declared openly. I think that what she means is that the alleged atrocities at Dachau can now be DENIED OPENLY. Professor Mehnaz M. Afridi teaches Judaism and Islam at various Southern California universities. She also offers public lectures and seminars. For more information, visit http://www.mehnazafridi.com. What is incredible to me is that this Professor of Judaism and Islam did not prepare for her visit to Dachau. When I first visited Dachau in 1997, there were no websites about Dachau on the Internet. I put up the first website about Dachau in 1998. Since then, I have expanded that website to include lots of information about Dachau, which you can read here.